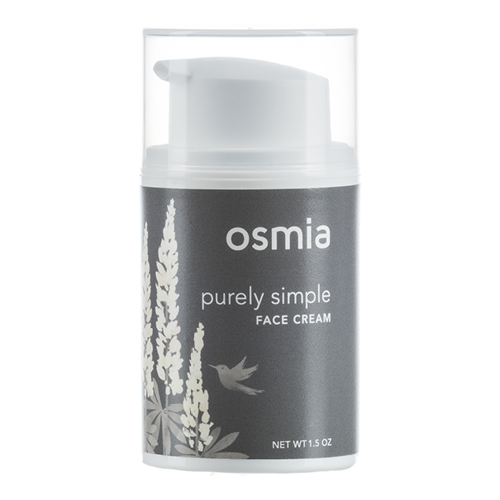 Purely Simple Face Cream by Osmia is the perfect facial moisturizer. Free of ethoxylated emulsifiers and harmful preservatives, this cream offers a gentle, nourishing feel with mild ingredients, like organic aloe vera, sweet almond oil, and apricot kernel oil. The non-greasy formula leaves skin looking refreshed and plumped, day and night. Purely Simple Face Cream's formula offers a nurturing feel to skin year-round, and can be used to improve the look and feel of dermatitis, eczema, and psoriasis. Apply a pea size pump of Purely Simple Face Cream and massage onto skin day and/or night. For an overnight skin recovery treatment, pump a generous amount of Purely Simple Face Cream and add 3 droplets of Osmia Nectar Vital Rose Drops. Massage upwards from decollate and neck over cheeks to the forehead and with 10 circles at the temples. Breathe in and release daily tension. Massage leftover cream into dry lips and fingertip cuticles. I purchased this for my daughter, but she didn't love it. Her skin is teen skin, so this was perhaps a bit too moisturizing for her. Therefore, I took it and thought to just finish it off. However, now I am a fan. This is wonderful for more mature, dry skin. It provides all day moisture but soaks in enough to allow for nice application of make-up. This is a definite re-order. I love this for when my skin is being sensitive or just needs a little extra. My only gripe is that it seems to run out more quickly in the new packaging.